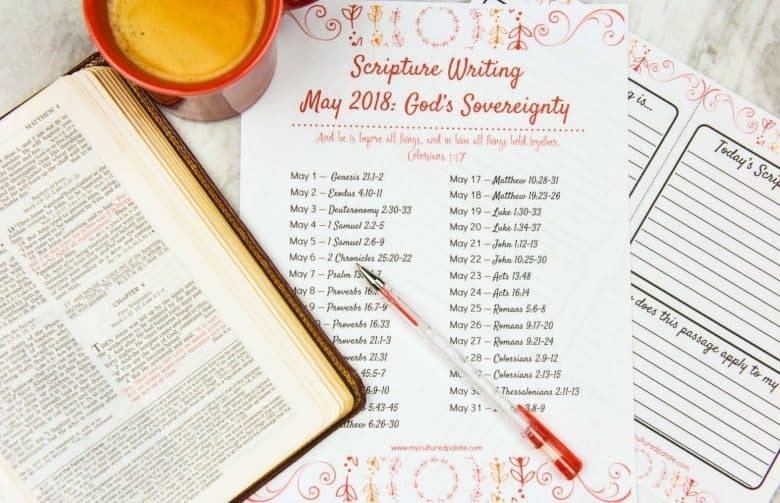 The Scripture Writing Plan for May focuses on verses that deal with God’s Sovereignty. Not familiar with scripture writing? It is a way to spend time in Bible study to help you grow in your Christian walk. As the name implies, you write the verses. Sound easy? It is! That is why I love it because, let’s face it, as a busy mom, life happens. Some days there is plenty of time and other days it feels as if you are hanging on by the skin of your teeth! Scripture Writing gives you the freedom to spend the amount of time you have, focusing on particular verses. Each day’s verses can be written in ten minutes or less. But, you can always spend more time on them! Read the verses, write them, pray through them and meditate on them. A Scripture Writing Plan is a great way to focus on the life God has for you to live – fulfilling the purpose He has for you. With this month’s Bible Writing Plan, you get the verses for each day of the month along with coordinating lined paper to print for a 3 ring binder. There are 2 ways to print the lined paper, full page or half pages for use in smaller notebooks. You also receive a cover and 3 size options for spines to use with your binder. As a bonus, with each set, you receive a Prayer List printable and two different Bible reading plans. 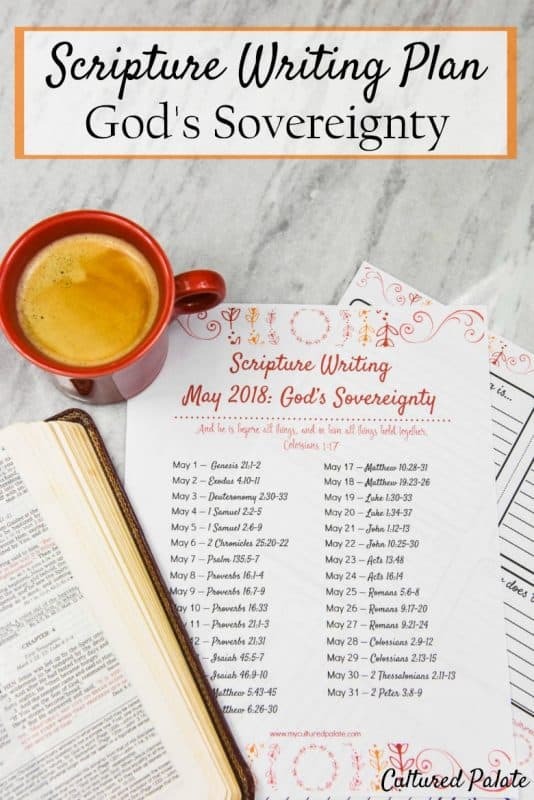 As I said, this month’s scripture writing plan is about God’s Sovereignty. So, what does “God’s Sovereignty” mean? Put simply, it means that God is in control – no matter what happens. Isn’t that comforting? 1. A Scripture Writing Plan differs from other forms of Bible study because as you write the verses, you are engaging your other senses. Studies have shown that the more senses that are used in the learning process, the more effective and long lasting are the results. By going through the act of writing, you are more focused. How many times have you been reading, put it down and wondered what it was you just read? This Scripture Writing Plan helps alleviate that and along with engaging you mind will hopefully capture your heart as well. 2. Scripture Writing is a great way to memorize verses. I don’t know about you, but when I am trying to memorize I will often write the verse or verses over and over until they are ingrained in my mind. 3. Scripture Writing is NOT just for adults! It is a great way for children to practice their penmanship or new lettering skills – not to mention adults getting creative with learning new lettering styles. 4. Last but certainly not least – it gets you into the Bible. With such a small time commitment, scripture writing is more manageable than other more intensive studies. They are great – don’t get me wrong. But to be honest, they can be overwhelming and our goal is to be inspired with God’s word.